Blog length- What do 700 words, 1,800 words and 2,500 words look like? Because we do Search Engine Optimization – we often have to talk about the differences between short and long-form content. 700 words have been an average blog post for a while, and 1,800 – 2,500 words has become the new number to strive for to keep people on the page longer and increase your search engine ranking. 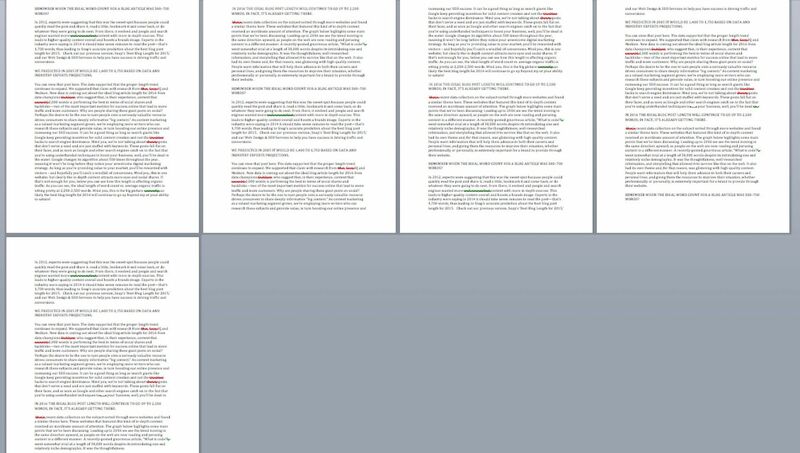 So what does 700 words look like? What do 2,500 words look like? What do 700 words, 1,800 words, and 2,500 words look like– here are photos albeit zoomed-out. We’re sharing a little bit of a visual indicator so you can be aware of how much needs to be written – whether you’re writing a search engine optimized article, or you’re writing a paper for school. This is single spaced in Microsoft Word, but it would likely by similar in Google docs if that’s your text editor of choice. How many pages is 700 words, 1,800 words and 2,500 words in a Word document? Don’t hold back any valuable insights for later – give as much value, and share the best ideas in sub-headlines, bulleted lists, and support your main points with significant statistics, original research, and poignant personal stories. After you have a “very rough – rough draft” start going back and editing your writing for grammar, spelling and make sure that the ideas are cohesive and tied together by a line of thought, and key idea. Resolve the end of the article by re-capping the key idea and sum up the whole line of thought. Yes, 1,800 words to 2,500 words are a lot of words, and not every article requires this kind of intensity (for instance, this is a resource post with much fewer that 1,800 words. However, if you’re trying to prove a contentious point or provide the “definitive” resource on a particular subject – all of that verbiage really does allow a lot of opportunities to support your key thought.